Hooray for Universal Pre-K in New York City! Earlier this year, I wrote a story called “How to apply to NYC Pre-K and look ridiculous doing it.” After being waitlisted for nearly every school we applied for, I followed up with “How to be totally prepared to apply to NYC Pre-K and still completely fail.” Today, I would like to share the final chapter of our unexpected educational trilogy — getting our child into New York City’s Universal Pre-K Program. Why did I write these stories, you ask? That’s a great question. Indeed, getting my sticky, whiny kid into Pre-K is a topic I never imagined that I would be fretting over and blogging about. You simply find your school, click apply on the Department of Education website, and you’re done, right? Well, it’s not quite that simple. I built an absurd weighted ranking system, so that I could figure out how to order our choices. I’ve made this available to use—simply make a copy of the Google Doc linked above, and you’re on your way to achieving levels of parental insanity that people outside of New York will surely laugh about. Then, after all that work, our daughter was waitlisted at nearly every program we applied for. She was offered a spot at several Pre-K Centers in Manhattan, but they don’t have after-care. This isn’t ideal for working parents—we had to turn those offers down unfortunately. The good news is that we finally got our daughter into a great Pre-K program, and despite the odds in some neighborhoods (Upper East Side, I’m looking at you), I am confident that you will too. How does one find their waitlist numbers? Good question. You have to call each and every single program. When you don’t get into a program that you put on your application, you will be waitlisted (as long as that program is listed higher than the offer you received in your order of preference). 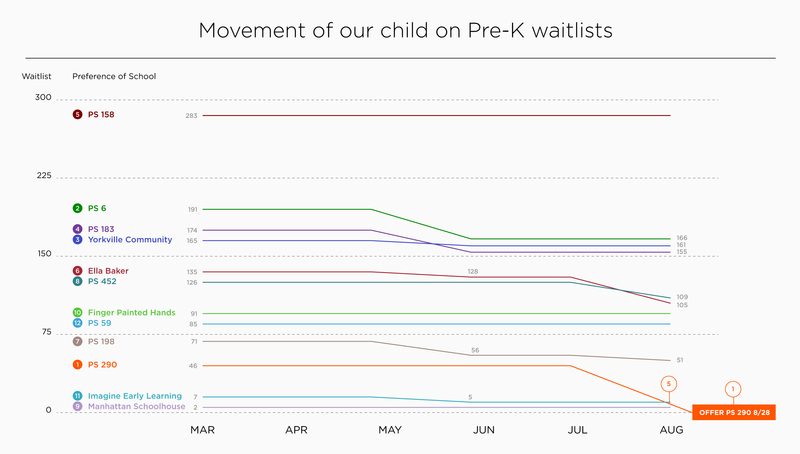 So like a crazy person, I called every month through the summer, and got the waitlist number for my child. It was time-consuming and sometimes painful — but I wanted to understand how this process works, and share it with you. Don’t panic—you will get into a Pre-K program. Even if it’s a week before school starts (or a week into school), the Dept. of Education will make sure you get into a program that works for you. Your city council members may also be able to assist you with this (thank you Ben Kallos)! The waitlists will move significantly at the end of summer. When kids get accepted into private school, the DOE doesn’t know until they start calling parents. This happens near the end of summer, and waitlists can move rapidly at this point. I only encountered this with a few programs, but if you are super high on the waitlist, some schools may refuse to give you the number. My advice is to keep calling, and be nice — the school employees are working hard for our kids. As you can see, there was a little bit of movement in May, and then a lot more in August. However, I know there was actually more movement on some of these lists. There were a few select schools that basically got annoyed at all of my calls, and would ask me “what number was your kid last month?” After they put me on hold for about 5 seconds, they would come back with… remarkably, the same exact number. My advice again is to be nice, and keep calling. I am happy to say that after all of the phone calls, school tours, information sessions, and badgering of parent-teacher coordinators, we finally got into our zoned school. We had been waitlisted for 14 out of 15 total applications (12 in Round 1, and 3 in Round 2). Our daughter’s school is right around the corner from our apartment, and it’s the one we always wanted. The Universal Pre-K program is really amazing, and we’re so incredibly thankful for the opportunity that the city has provided for all of our children. Mayor Bill DeBlasio has even started a 3-K program that will get even younger New Yorkers into school. Good stuff! ← Homework is for students, not design professionals.